You are a treasure hunter which objective is to get enough gold and precious stones before the time finish. 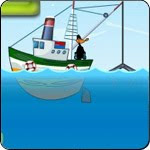 Use the mouse-left button of the mouse or the arrow keys to move your hook. In the store you will be able to buy improve to your ship.